WASHINGTON, DC — It’s been a rough year for pharmaceutical giant GlaxoSmithKline (LSE: GSK)(NYSE: GSK.US) — investors are concerned about the upcoming patent expiration of its top-selling drug Advair and bribery allegations in China. Despite these concerns, the stock is still up 15% year-to-date, handily outperforming its closest British competitor, AstraZeneca (LSE: AZN)(NYSE: AZN.US). Last Wednesday, GSK reported its third-quarter earnings. On a constant exchange rate, the company reported a 1% year-over-year increase in revenue to 6.51 billion pounds, or $10.6 billion, as core earnings rose 10% to 28.9 pence, or $0.47 per share. GSK’s sales fell short of the Thomson Reuters’ estimate of 6.65 billion pounds, but earnings topped the consensus estimate of 27.2 pence per share. GSK faced two major problems during the quarter in its pharmaceuticals and vaccines business, which accounts for 80% of its total sales. Sales of the segment’s top-selling asthma drug, Advair (also known as Seretide), posted across the board declines in most global regions, and a worsening scandal in China took a huge bite out of its emerging market sales. Let’s take a closer look at these two key problems. Advair, one of the top selling drugs in the world, generated $8.1 billion in sales last year. During the third quarter, Advair sales of $1.96 billion accounted for 18.6% of GSK’s total sales and 71% of the respiratory segment’s revenue. GSK’s respiratory portfolio accounts for 26% of GSK’s total sales. GSK is trying to squeeze out every last bit of revenue from Advair before it faces generic competition, since the U.S. patent for the medication expired in 2010 and will expire in Europe later this year. However, Advair hasn’t faced generic competition yet due to the complexity of its proprietary Diskus inhaler, which is patent protected until 2016. However, once companies successfully replicate the Diskus or create an alternative inhalation device, Advair sales are expected to plummet. The most widely used alternative treatment to Advair is AstraZeneca’s Symbicort, which generated $3.2 billion in sales in 2012. Symbicort’s patents will last slightly longer than Advair — the first patent for its medication expired last December, but the patent on its inhalation device runs out in 2018. During the third quarter, Advair sales growth was mediocre across the globe, as seen in the following chart. That global 1% year-over-year decline from the previous year hints that GSK might not be able to post higher sales of Advair in 2013 than 2012. The major culprit is a steep 12% sales decline in the EMAP region due to its ongoing bribery scandal in China, which brings us to GSK’s second problem. Investigators in China claim that GSK used local travel agencies as fronts to funnel illegal kickbacks to doctors and government officials to boost drug sales. The government is also investigating Sanofi, Eli Lilly, Merck, Roche, Novartis and AstraZeneca on similar charges, but charges against GSK are by far the most damaging. Those problems took a bite out of GSK’s EMAP pharmaceuticals and vaccines revenue during the third quarter. A 61% year-over-year decline in overall sales in China caused the EMAP pharmaceutical and vaccine segment’s sales to slump 9%. Excluding China, EMAP sales would have risen 5%. GSK stated that it would “continue to co-operate with the authorities,” but that it was still too early to “quantify the longer-term impact of the investigation on our performance in China,” as stated in the company’s third quarter earnings release. Despite these problems, GSK still has some positive growth catalysts on the horizon. During the quarter, the company achieved two new approvals in the U.S (Tivicay for HIV and a flu vaccine), one in Europe (Tafinlar for metastatic melanoma), and another in Japan (Revlar/Breo Ellipta). Revlar/Breo Ellipta and Anoro Ellipta, two new treatments for COPD (chronic obstructive pulmonary disease) co-developed with Theravance, could help fill the eventual gap left by Advair. Breo Ellipta has been approved in the U.S. and Japan, and could achieve peak sales of $1.3 billion, according to analysts. Anoro Ellipta has been recommended for approval by an FDA advisory panel, and is forecast to generate peak sales of $1.4 billion. Neither product has been launched yet. However, GSK will have to contend with Novartis, which is also fighting for a piece of the COPD market with three treatments — the Arcapta (Onbrez) Neohaler, which is approved in the U.S., Japan, and Europe; the Seebri Breezhaler, which is approved in the U.S. and Europe; and the Ultibro Breezhaler, which is approved in Europe and Japan. Beyond COPD, GSK also made three new FDA filings during the quarter — a first-line treatment for chronic lymphocytic leukemia, an HIV treatment, and an asthma treatment. The company has also sold non-core assets such as its beverage business and its blood thinners, for $2.16 billion and $1.1 billion, respectively, to reinvest in research and development. 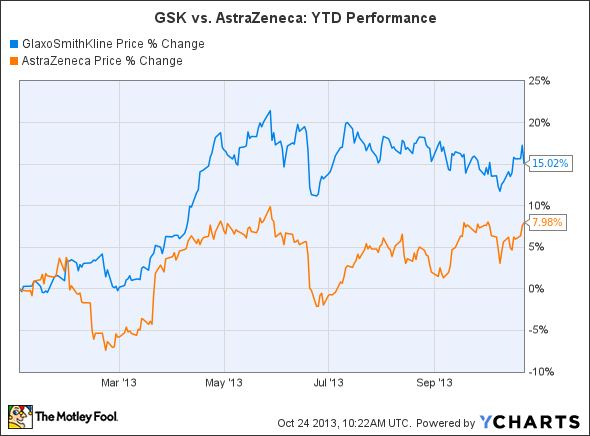 Will GSK pull out of its slump in China in a timely manner? Will new drugs, such as its COPD treatments, be approved in time to replace Advair? If the company can achieve these two goals, there might be further upside for the stock, which is currently at a five-year high. Otherwise, investors should expect some stagnation ahead in the near term. If you're looking to add a solid 5% yield to your portfolio, you could do worse than a company that could still prosper if the economy turns for the worse, as well as deliver a healthy gain if sentiment suddenly improves -- featured in our special free report. > Leo does not own shares in any company mentioned in this article. The Motley Fool has recommended shares in GlaxoSmithKline.